When you decide that having a cheese wedding cake is something that might interest you, there a couple ways that you can integrate it into your wedding. If you are a lover of the finer things in life, you might consider having a wine and cheese themed wedding. Wine is always a popular theme for weddings, and that might be due to the fact that so many couples choose to get married in a beautiful vineyard setting. Unique cheeses would be a perfect compliment to a wine theme, and a selection of decadent cheeses in the form of a wedding cake would fit right in with the sophisticated setting. 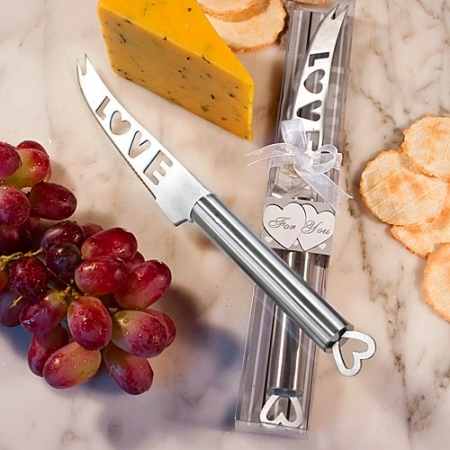 You can even tie the whole wine and cheese theme together with grapevine inspired centerpieces and some Amore Stainless Steel Cheese Knife Favors for your guests. Maybe you love the idea of a cheese wedding cake, but you still want to have something sweet for dessert. You should consider having a smaller cheese-cake at the orderve table during the coctail hour. In addition to being a conversation piece, your guests will appreciate having something easy to nibble on while socializing. The coctail hour is traditionally a time when guests enjoy drinks and appetizers while standing, so serving something easy to handle like cheese will ensure that the focus will be on conversation and not on juggleing a messy orderve plate in addition to a cocktail. No matter how you choose to display your cheese wedding cake make sure you take into consideration not only your taste but also your guest's taste as well. Choose unique cheeses that will appeal to a wide variety of tastebuds. If you do choose to include a particularly strong cheese, make it one of the top layers so that it is smaller and leave the larger layers for the types of cheese that most everyone will go for. Choose cheeses that are both tasty as well as beautiful to look at, and then decorate as you would a regular wedding cake with flowers, ribbon, fruit, and a cake topper.